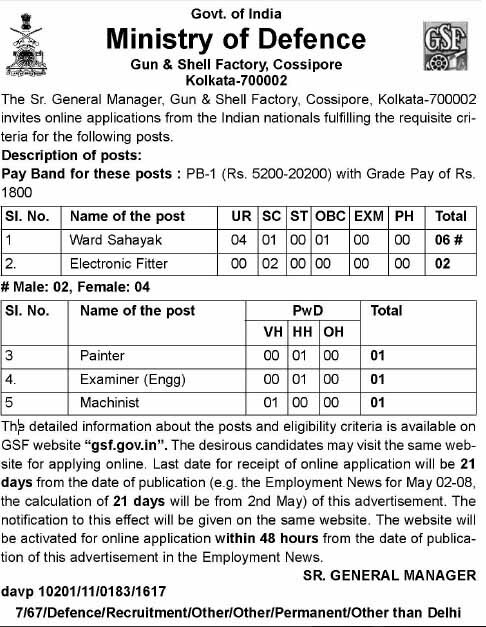 MInistry of defence asked for join 33 Field Ammunition depot for given below posts under decent pay band with Grade pay and other allowance. Candidates should not below 18 years and not more then 25 years. Age relaxation are as per government rules, 18 to 28 years for OBC, 18 to 30 years for SC/ST and 18 to 40 years for PH candidates and candidates who are involved in sports must be aged between 18 to 40 years. Education Qualification:- Minimum qualification for all these jobs are 10th pass Matriculation or equivalent from recognized board or university. Last date of application : 21 day from date of publication. 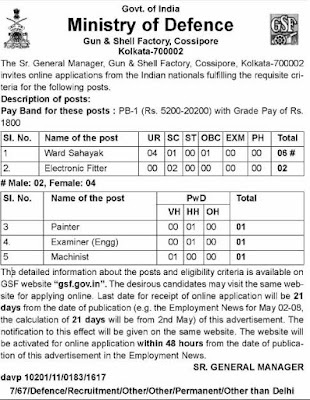 Ministry of Defence, Gun & Shell Factory, Cossipore Kolkata-700002 invites online applications from the Indian nationals for the following posts.